Toby Marks AKA Banco de Gaia, started playing regularly at Club Dog in London from about 1991 having developed a live show in his home town of Leamington Spa and released 2 excellent self-produced albums Medium and (in 1992) Freeform Flutes And Fading Tibetans. His unique and evocative blend of electronica with world-music styles earned him a fast-growing and loyal live following. Banco de Gaia seemed an obvious next signing for Planet Dog and the result was the release of the Desert Wind EP in 1993 followed by the much acclaimed Maya album in 1994. 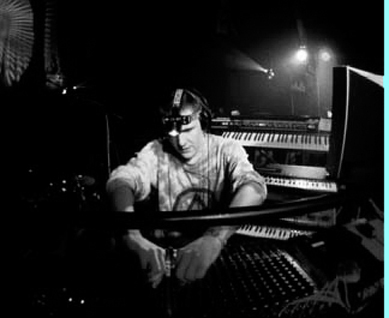 Maya featured studio versions of many of the tracks that had become the mainstay of Banco de Gaia's live sets and consequently was an immediate hit with his growing fan-base. The Heliopolis EP was also released in 1994, a track from which appeared on Sasha and Digweed's ground-breaking Northern Exposure compilation the next year. 1995 saw the release of the immensely popular Last Train To Lhasa album to huge critical acclaim across Europe as well as the US and Canada. The skilful blend of sounds on Last Train To Lhasa produced a timeless release that was one of the 'must have' albums of that year and limited edition versions of the release (featuring bonus mixes) now change hands for huge sums on the internet. The album release was supported by EP releases featuring other mixes of Last Train to Lhasa and Kincajou. Live At Glastonbury was released in 1996. Featuring a storming set recorded in front of a large and enthusiastic crowd at the Glastonbury Festival in 1995, the album consolidated what had been a period of huge growth in Banco de Gaia's standing within the dance community and gave Toby a breathing space to work on his next studio album. The result, Big Men Cry, released in 1997 was a deep and very personal album featuring many timeless and deeply moving tunes. The simultaneous release of Big Men Cry both across Europe and in the US, gave Toby the opportunity to completely revamp what had up till then, been a one-man live show. His already massive reputation for stunning live performances was enhanced by the creation of a 5 piece band to enable Banco de Gaia to perform Drunk As A Monk as 'live' as possible. Enhanced with a specially designed lightshow, the band toured the US and much of Europe over the next year, securing a reputation for quality music that has endured to this day. Click here to see Banco de Gaia's discography.